Rolling acrylic paintings for storage and shipping is a fairly common practice, and many painters have likely rolled, un-rolled, and re-rolled their own paintings with some success. However, while we know it can be done, it is still not our best recommendation. There are definite risks to be aware of, such as the imprinting or ferrotyping of the surface, the sticking of interleave materials, and sometimes cracking if handled at cold temperatures. Some materials, like paper or bubble wrap, can also leave pieces stuck to the surface, creating a major restoration project that may never get the work back to its original state. 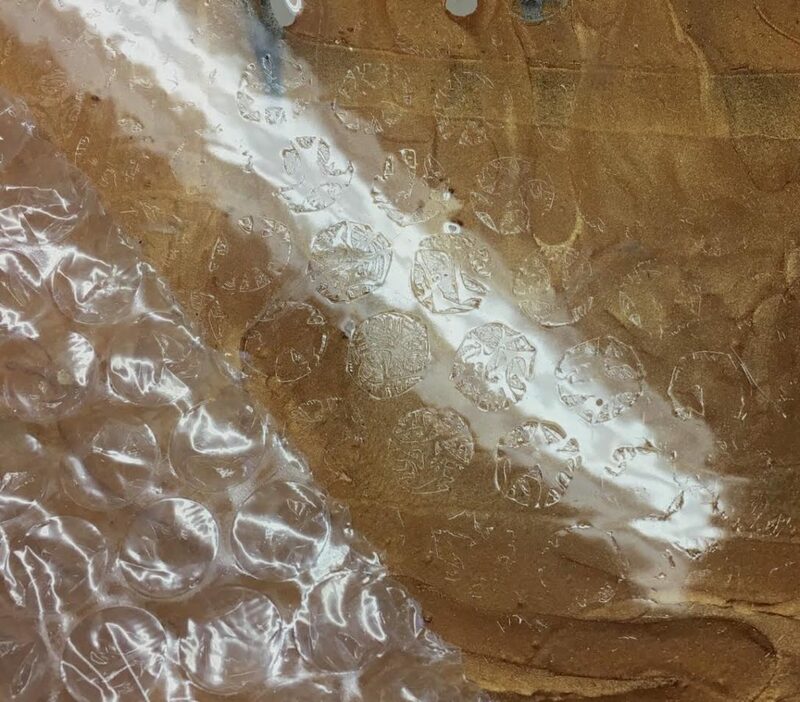 The first part of this article will address these issues in more depth, and show examples of the type of damage that can occur when rolling acrylic paintings using some typical interleaf materials. In the second part, we will share what to do if you feel you must roll and ship your painting. Imprinting from Bubble Wrap on glossy acrylic surface. Fine art grade acrylic paint and medium films are generally quite flexible, and so can be rolled easily at warmer temperatures, but this inherent thermo-plastic nature of acrylic allows it to go back and forth throughout its life, moving from very soft and flexible at warmer temperatures, to harder and potentially brittle at very cold ones. These changing characteristics can cause problems when the painted surface is in close contact with another surface for an extended period of time, or when suddenly flexed or shocked at cold temperatures. Flexibility of an acrylic skin at room temperature or warmer. Result from sudden shock to an acrylic skin just taken from the freezer. Cracking from suddenly flexed cold acrylic painting. Glossy acrylic paintings will be much more susceptible to imprinting and surface change, even if non-stick materials such as polyethylene plastic sheeting, or silicone release paper are used. With enough pressure, heat and time, sticking and ferrotyping can still occur. While polyethylene sheeting can be peeled off , its creases and even the micro-texture of its surface can still leave a lasting change. We have even seen silicone release paper stick to acrylic films after weeks of pressure and warm temperatures. Matte surfaces will be less prone to sticking, but thicker layers can still be compressed and imprinted. 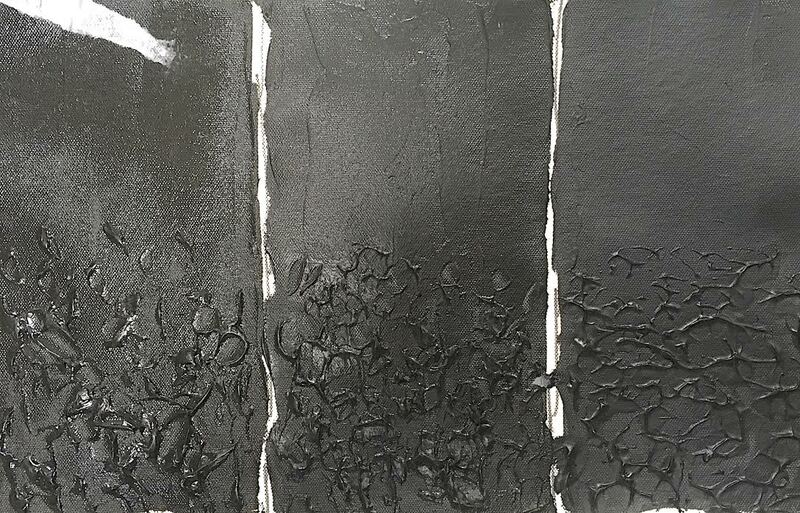 A matte acrylic can also become glossy if burnished or pressed against a very smooth material, while a glossy acrylic can become matte if pressed against a textured one. Stain paintings, and very thinly painted matte surfaces, can often be rolled and unrolled with much lower risks and usually with no noticeable damage since the paint has become so integrated into the canvas or ground. The following images point out the most significant damages. 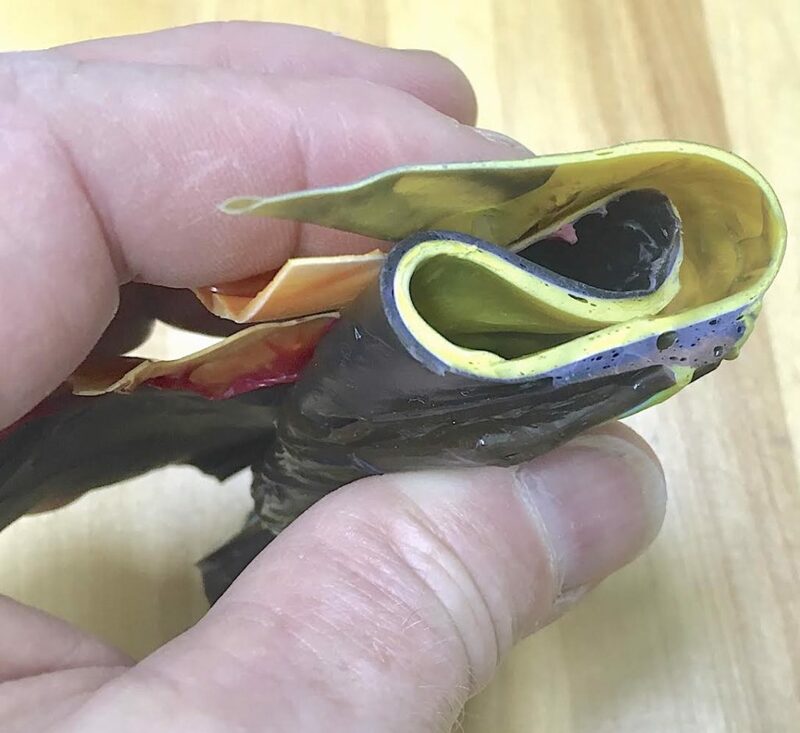 Polyethylene Plastic, Dartek Film or Silicone Release Paper were able to be removed without any tears, but there were still changes to some of the surfaces, especially any raised or textured areas. Rolling with no interleaf material was not terrible, but of course left canvas texture imprinted on raised areas and even some canvas fibers stuck in places. Rolling with the paint against the cardboard tube picked up fibers from the cardboard on glossy raised areas. As expected, it appears that relatively thinly applied acrylic paint, especially with lower sheens, can be rolled successfully with minimal visible changes to the surface, but we would still caution that we feel there will always be some risk. Glossy acrylic surfaces turned matte on raised areas (silicone release paper). Matte acrylic surface turned glossy in raised areas (Dartek). White kraft paper torn and stuck to surface. Glassine torn and stuck in a few areas. 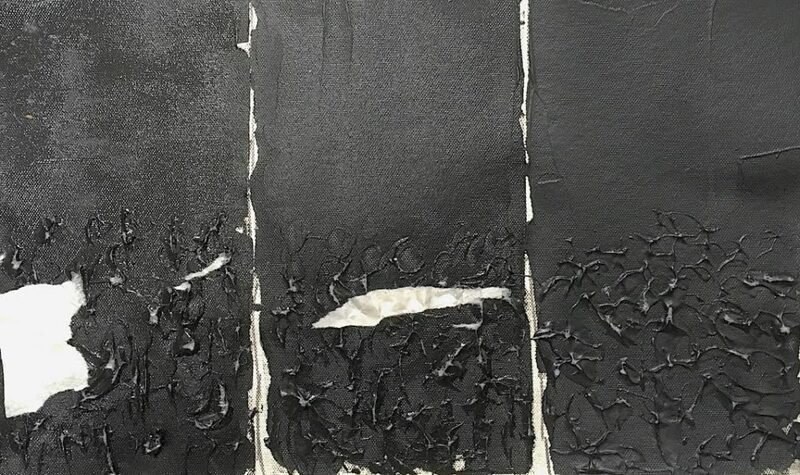 Tissue paper torn and stuck to surface. 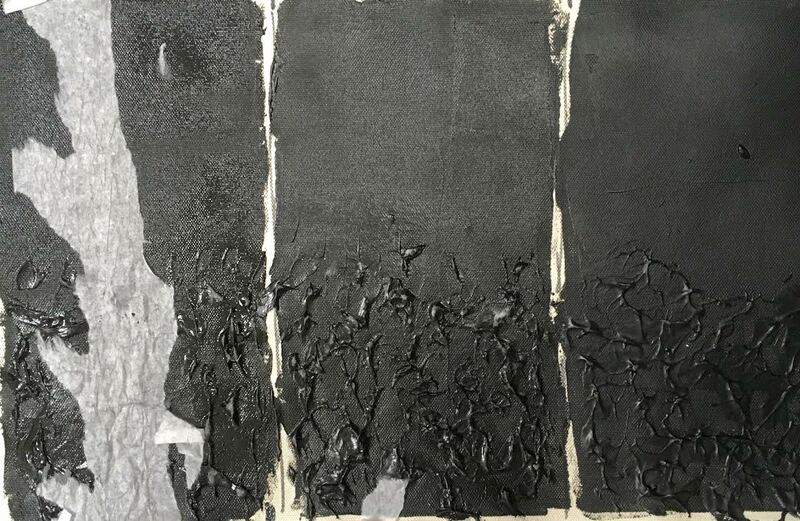 Paintings rolled with no interleaf material will tend to be imprinted by the canvas texture pressing directly against the surface, dulling glossy surfaces and sometimes causing canvas fibers to get stuck to the acrylic. 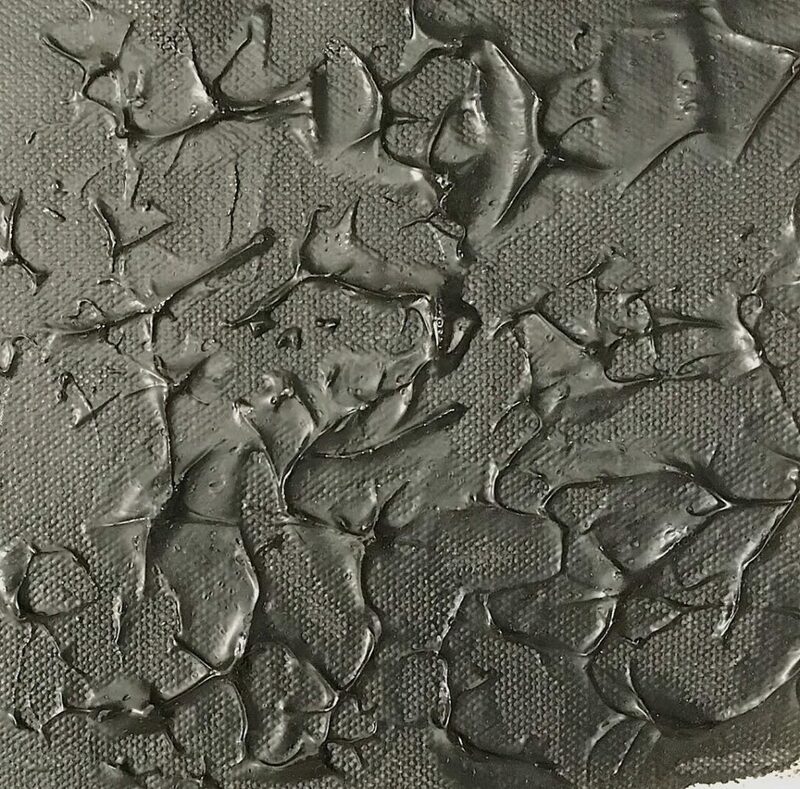 Glossier paint in particular can stick to most surfaces and, even if the material can be peeled off, will leave a changed surface at some level. So simply using a material that does not stick to a relatively soft and tacky acrylic film does not insure success. 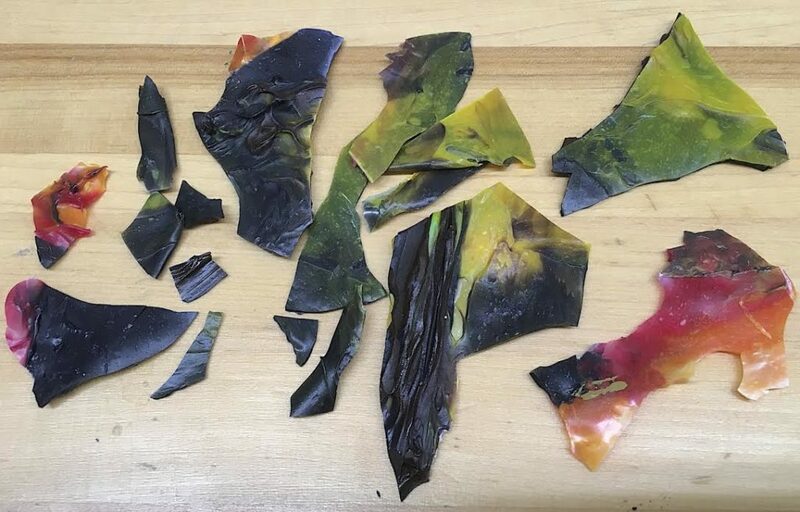 It is better than peeling hundreds of small pieces of bubble wrap plastic or tissue paper from the surface of your painting, but the result is still a permanently damaged piece of art. However, because this is not always possible, we wanted to provide at least one potential way to roll paintings that should help lessen some of the risks even if it cannot remove them altogether. Please note that the following method assumes rolling, unrolling and shipping in a climate controlled environment. As we showed earlier, acrylics can get quite brittle at colder temperatures and can crack if flexed, shocked or suddenly creased. As with all rolled paintings, this works best with a relatively thinly painted work having a satin or matte surface. The glossier the painting, and the thicker the textures, the greater the chance of damage. 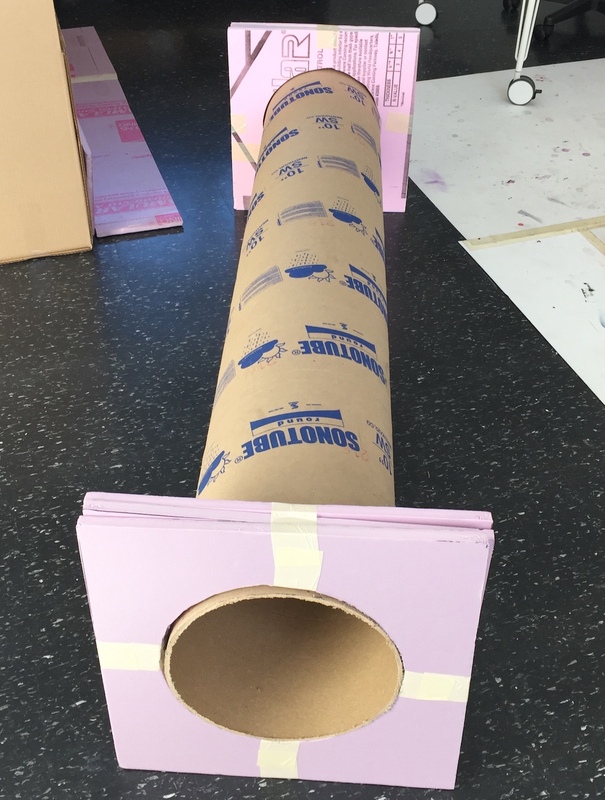 ½” rigid insulation foam to line box and make “donut” at each end. 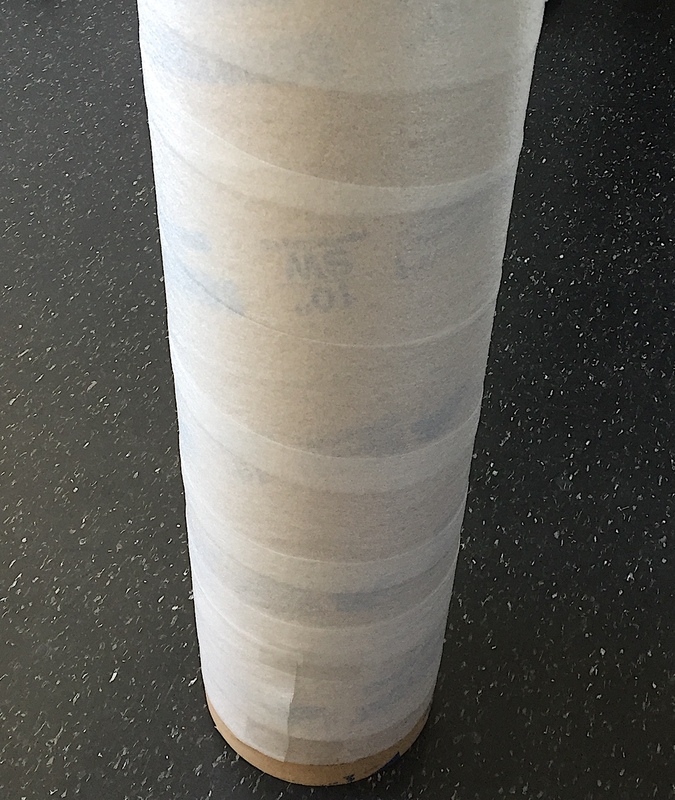 Wrap 10” diameter tube in thin packing foam sheet. Foam can be spiraled onto tube. Leave 2 inches blank on ends of tube. 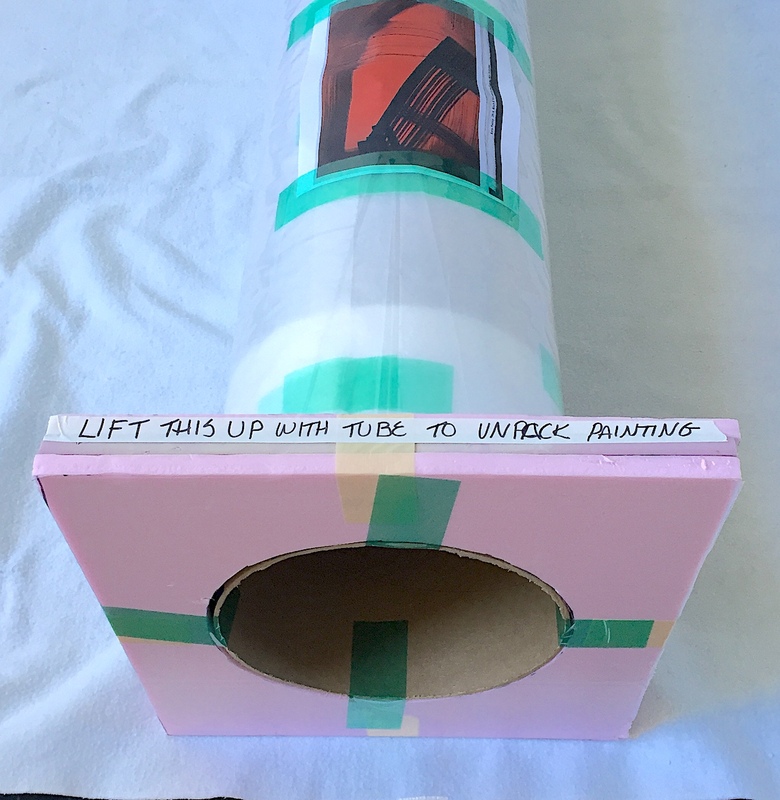 Tube must fit into recessed holes at each end of the box. Painting is laid face-down onto silicone release paper. Thin foam sheet placed on top of this, covers back side of painting entirely. Foam sheet can be seamed with tape but seam/tape side doesn’t contact the canvas. Painting is rolled onto already-padded tube and secured at edges with tape. Painting roll is covered with plastic sheet but plastic is not contacting any surface of the canvas. Taped to secure onto tube so it doesn’t shift. Pre-cut “donuts” fit onto ends of tube. Secure with tape. The entire thing is placed into the box so the tube is suspended. 3-4 Inches around tube to sides of box. Nothing touches artwork other than the silicone release paper. Artwork is suspended inside the box with very little pressure on the surface of the painted side of the work. We would like to thank artist Kate Petley who was very kind and generous in allowing us to use some of her photos, ideas and methods for packing rolled acrylic paintings. As always if you have questions, let us know in the comments or email us at help@goldenpaints.com. Thanks for your help,Scott. Very informative. Imam not shipping right now and need to store 30 5×7”. Acrylic paintings. You helped me through. The isolation layer and varnishing process a couple of weeks ago. Wow this effect is so cool. Thank you I’m going to use this. I always wondered how you get that look on a painting. We aren’t sure which particular effect you are referring to, but if you mean one of the ferrotyped surfaces, then it certainly could be possible to use one of these surface changed effects in a focused and intentional way. 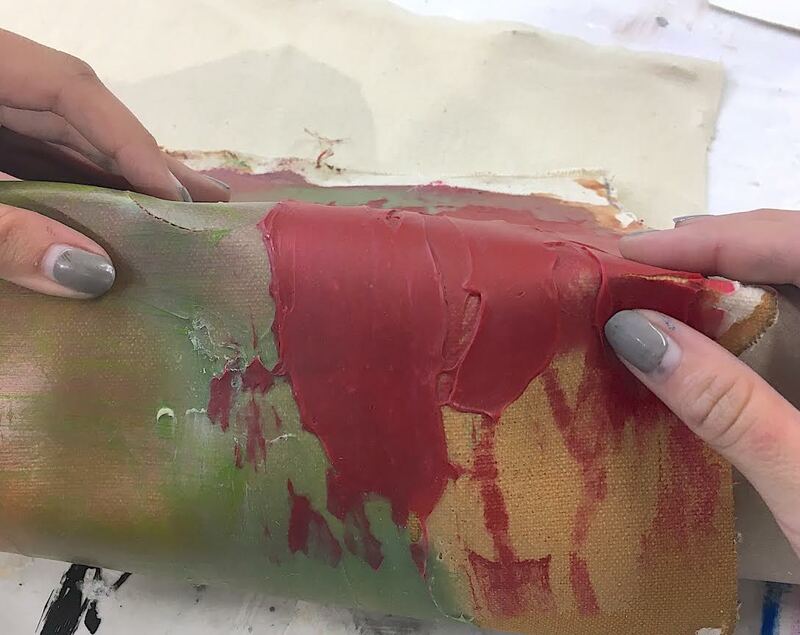 In fact, there is a technique where you can heat up a glossy acrylic surface with a hair dryer, making it softer and tackier for the purpose of adhering paper or other thin collage elements. The bubble wrap effect could backfire as if it sticks really well, it will tear into lots of little stuck pieces when you try to pull it off. If there is another effect you are interested in, just let us know! Thank you for the article is an interesting approach that certainly limits impacting the canvas. The outter rectangular box will have to be strong enough to take an impact at its weakest point i.e. the middle. A second larger heavy duty tube suspended around the 10″ tube migh mitigate that. Alternatively a plywood crate should withtstand any hard knocks. However…Step 4 though is confusing me – when you say “…Painting roll is covered with plastic sheet but plastic is not contacting any surface of the canvas…” – how is this possible?. The painting having been rolled facing outwards will have a certain amount of painted canvas exposed. How can this be covered by a plastic sheet without contacting the surface of the canvas? You are most welcome. And you are right, the outer box will need to be strong. Well built wood crates will be best for both rolled paintings and of course stretched paintings. In the past, we have recommended placing rolled and packaged paintings inside a second tube, and that tube can simply be the final container. And I am sure there is a way to suspend the inner tube inside the larger outer tube to create a similar situation. 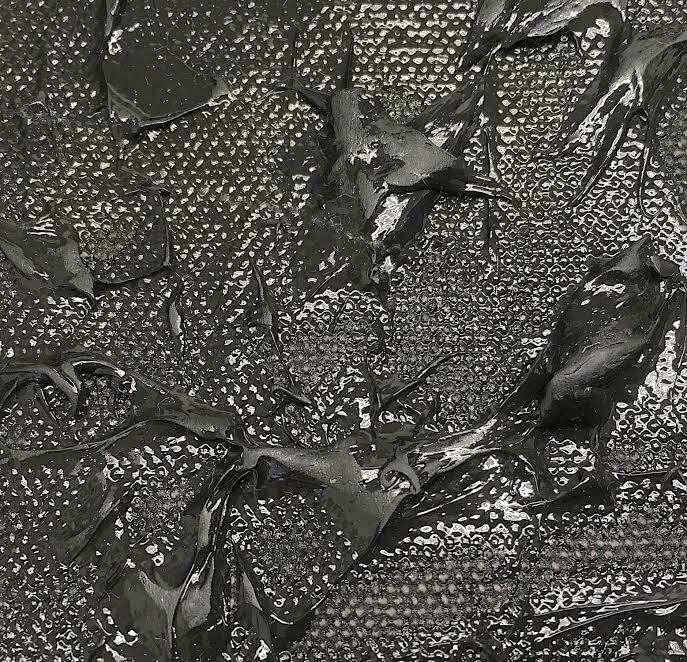 The answer to your question about how the plastic sheeting is not contacting any surface on the painting, is that the painting is covered with silicone release paper or film and the back of the canvas has the thin foam, so the plastic sheeting does not touch any part of the canvas or painted surface. We mention this under “Method”, # 2. This was very helpful. I was wondering however, if this is a method you would recommend in transporting a painting via airplane? It is certainly possible that this method could be helpful if the work needed to be transported on an airplane, but we do not have any testing to offer any guarantees. We can tell you that vibrations from transport can cause some issues with stretched paintings, so a very carefully rolled, thinly painted acrylic painting, might be better off than a stretched on, in this case. The other potential issue with air transport is the possible cold temperatures in the cargo hold. Acrylic is thermo plastic and gets hard and brittle when cold, so movement presents a problem. Again, a carefully rolled painting might fare better. This is all assuming the crate is not dropped or shocked in some way during transit. I am getting very information from this valuable post. 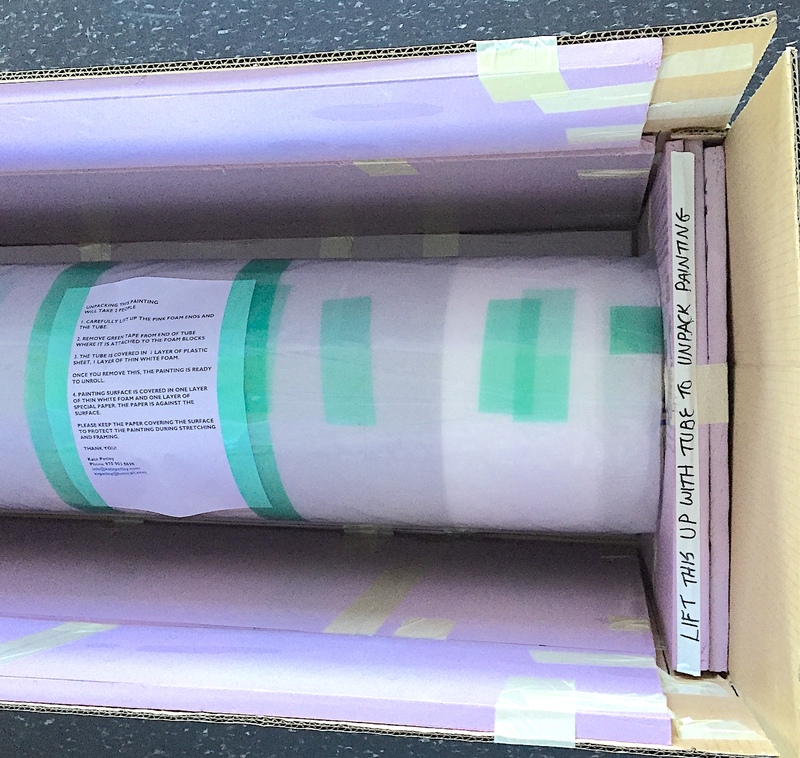 it is a very helpful post about Rolling Acrylic Paintings for Shipping or Storage. I was wondering, however, if this is a method you would recommend in transporting a painting via Construction Hoist Lift? We are happy that our article has been helpful for you. It is very hard to comment on the use of a “construction hoist lift” in moving a painting, as this method holds quite a lot of unknown variables in terms of potential sudden movement or shock. All we can say is that assuming the process is gentle and there is no sudden shock to the carefully rolled and crated painting, it could, in theory, work.